I’v been thinking and making dreams and visions for the next expedition with The Shirt. I’m on “ready” and soon “go”. Making me ready now and starting in ca 58 days. The Danube (English pronunciation: /ˈdænjuːb/ dan-yoob) is a river in Central Europe and is Europe’s second longest river after the Volga. It is classified as an international waterway. The river originates in the Black Forest mountain range in Germany as the much smaller Brigach and Breg rivers which join at the German town of Donaueschingen. After that it is known as the Danube and flows southeastward for a distance of some 2,872 km (1,785 mi), passing through four Central and Eastern European capitals, before emptying into the Black Sea via the Danube Delta in Romania and Ukraine. Then I have to find my way (that has to be easy!) 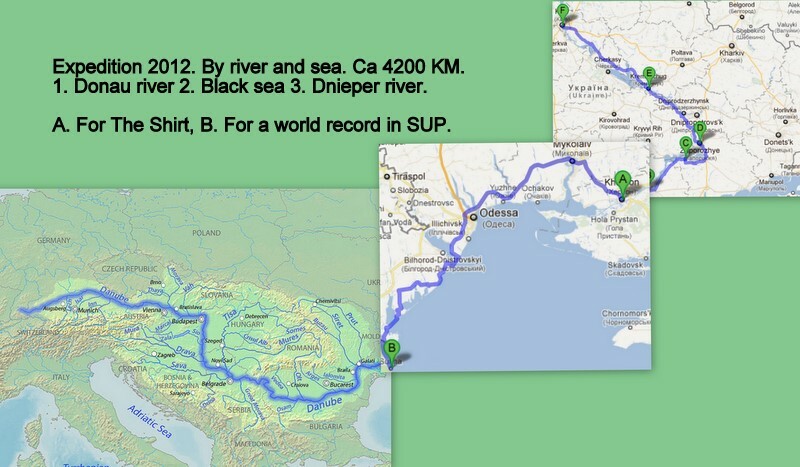 on the Black Sea, and paddling up to the river Dnieper and on that river I’ll find Kiev. Same start as on the Norway to south Africa trip. No sponsors but a big dream and lot of power. Hope you’ll join the trip!